Metallic leather in 30 different colors without using foils? PrimeAsia, a valued member of Total Shoe Concept has created a high quality, high performance metallic leather using traditional leather finishing methods. PrimeAsia has been selling high intensity metallic leathers for more than ten years using metallic foils which have been applied to the surface of several of their base tannages. High intensity metallic foils have often come with many limitations including, poor color matching, poor physical properties, including but not limited to low abrasion resistance, low flex resistance and poor adhesion. Working with their suppliers and their R&D team in China for more than one year, PrimeAsia has developed a propriety process that allows them to match metallic colors with more consistency and provide superior performance specifications while using traditional leather finishing methods. 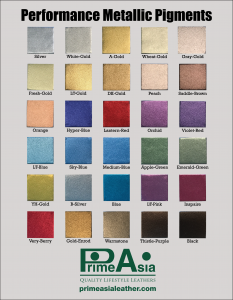 Each of these articles are available in 30 high intensity metallic colors.